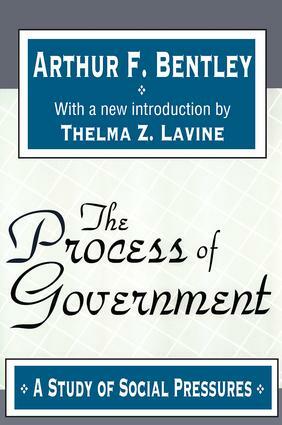 Arthur F. Bentley originally wrote this book over the years 1896-1908 while working as a Chicago newspaper reporter and editor, during which time he had a sense of tremendous social activity taking place, and a feeling that all the politics of the country, so to speak, were drifting across [his] desk. This prompted Bentley to develop an analysis of group interests, which he believed to be the true dictators of government decisions.He was hailed on methodological grounds as an early supporter of the behavioral revolution, which called for the use of natural scientific methods in the social sciences and for offering a group theory of politics. Bentley's implicit critique of narrow empiricism reflects the diverse influences of Dilthey, Simmel, and Dewey. The Process of Government was virtually ignored until the post-World War II period, but is now regarded as a classic in political science. Representative Government, Democracy, and Control by "the People"